Noticed some discussion of the NIST 5.4s interval. I think they were a little early (as they treated flexing behaviour in the Cam#3 footage as vertical movement). I'd suggest (using specific frame numbers to calculate) they were 0.467s too early, making the 5.4s metric more like 4.93s. Yet another set of pretty data Femr2. 5.4s down to 4.93s woooooooooooooo. Post #1 asked a very specific question. Post #31 too. You have danced ever since. Pick a spot out of any one of the videos you use. Just one spot and do as Tom has asked. Stop dancing with your 'BS' baffles brains sketch and your fancy garbage in/out data and pretty graphs. Pick a spot, show Tom, and lets see if your pixels and interlaced jargen differ. Lets see if your fence sitting works. Same camera, same distance, same light, same angles, same cameraman, same time etc etc etc. Put up or STFU. It is pretty obvious from this thread that there is an anti-intellectual element within this forum that is allowed to harass at will. Femr is introducing a tracking tool to measure actual building movement of any of the 3 towers with surprising accuracy. If we want to see the correct order of events during collapse initiation, or look for any detectable deformations leading up to each collapse, why wouldn't suchn a tool be welcome? Instead, femr is forced to endure an absurd amount of abuse from people who clearly know much less about this tracking tool than he does. This sickening level of abuse is allowed here. It seems encouraged through a pack, group mentality. Do you really need femr to explain why accurate measurements of early deformation and collapse initiation are important to the subject of CD or natural collapse? Maybe you could tell us how micro-measuring a video can prove anything. What I want is a straight forward response to the questions raised by Tom in the OP and reiterated throughout this thread. femr2 is versed in the dance. femr2 has used the same dance time and time again. The methodology and tactic used here by femr2 is the same used elsewhere. The very same technology, terminology, trickery and 'BS' was used by femr2 to attempt to convince the kids at uboob that an anomaly of a 'POD' was attached to the aircraft that struck WTC. femr2 attempted to use the same camera jargen, pixel jargen, interlaced, interpolated jargin top convince the kids that this anomaly was infact a bomb. femr2 used his 'tech knowledge' of all things camera and pixel in much the same manner. femr2 used all manner of 'BS' to attempt to convince the kids. Was it an anomaly? NO. Did it really require such terminology, pixel explanation, interlacing jargin etc etc NO! Did it require hundreds of post, many threads, countless graphs, videos and stills? NO!!!! Turns out that the 'POD' was infact the fairings that housed the undercarriage and wheels. In femr2's world it was a bomb. So I make absolutely no appology to you or anyone else for the manner in which I respond to such a charlatan. femr2 is pulling your chains. It does not require hundred of tech posts to tell me that. If Tom wishes to humour himself then that is Tom's perogative. Edited by Tricky: Edited for rule 12. Last edited by Tricky; 31st August 2010 at 07:09 PM. All for no reality based goal, the goal seems to be to back in CD. It is called failure Tom, you have to have a goal tied to reality in the real world, so this work is nonsense and a waste of time. BTW, tracking algorithms that are much better exist but you can't have them unless you buy them. This is total nonsense since there is no real goal, and in reality it only pertains to 911 because you and ferm2 have delusions about CD and can't figure out 911. When the work is done and published it will show a gravity collapse, either with better fidelity, or worse, some smoothed out version that looks good and could be used to show the point of interest in some cartoon as an subject with added background. This stuff works great for making up movies and not using blue screen. Super stuff. But the world of tracking is orders of magnitude past this basement hobby application to prove woo. In the real world steps can be sourced and referenced, not just made up and pushed as being correct. Ask him to source and reference his work, the points/claims/steps/methods/results/etc, it will not happen. When will you guys publish anything like Heiwa did with his letter? Last edited by beachnut; 30th August 2010 at 01:00 PM. femr2 is pulling your chains. It does not require hundred of tech posts to tell me that. If Tom wishes to humour himself then that is Tom's perogative. I on the other hand believe that precious time is being wasted by debating with such fools. Ridicule and pity is best suited. Oh boy. I just found the 'pod' video and the 'impact charges' video, along with several others on youtube. In some, he actually refers to "Flight 175" in quotes, as if it doesn't exist. I guess you didn't understand the question Abby. Last edited by alienentity; 31st August 2010 at 04:31 PM. Rather depends upon what is being observed. It is then how the data is interpreted that is important. Tracing of multiple features of WTC 1 *proves* that the upper section rotated ~1 degree before vertical drop ensued, that the upper block immediately deformed, and that it is highly likely that the core led other features, such as south wall failure. 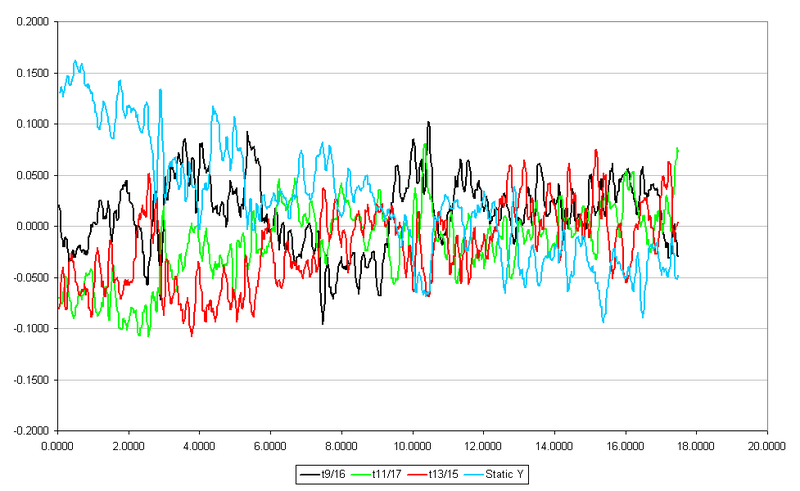 WTC1 trace data has also been used to show a number of *mini jolts* during the early descent. Therefore, God Bush did it. Good news. The NIST copy of the Cam#3 footage is about to become available (hopefully in 7 minute form). FOIA release. When I get hold of it I'll be dumping the current Cam#3 dataset and redoing it. The new version will have the shortest and most traceable chain of custody yet, with NIST being the only body in between the original CBS raw footage. May compare the datasets simply out of curiosity about quality difference. Last edited by femr2; 2nd September 2010 at 09:52 AM. I've applied some processing to the data. 2) Normal 2 point moving average for jitter treatment. 3) Average of all four traces taken as root. 4) Variance as subtraction of each trace from root. 5) 7 point moving average on variance data (just to simplify the display). I imagine the step you'll object to most is the first, though I am sure you can see why I have included it if you look at each static trace of the same graph without applying offsets. As mentioned above, the NIST copy of the Cam#3 footage should be with me shortly, though even that looks like they have messed with the contrast and brightness to a ridiculous amount. (I imagine they did so to simplify their home-grown tracing procedures.) As NIST have now released their lightened version of the original CBS footage, there can be no reason for not releasing the original CBS data directly, and so if it's not in the 7Tb dataset, it will be requested fairly promptly. Best result there is that I get hold of the original 7 minute version with original colour. Did you not follow the same methodology and techniques when you wrongly determined that the manufactured undercarriage fairing was in fact an anomalous 'POD' bomb? I seem to recall you used much the same jargon and methods to quite vehemently state that it was most definitely a bomb strapped to the underside of a commercial aircraft. It wasnt!!!!! I am curious to ask if you have ever retracted your technical findings once you realised you were wrong? It certainly doesn’t appear that any of your findings have ever been retracted once proved wrong. Wouldn’t you agree, femr2, that it is prudent for those seeking the truth to admit when they were wrong and that to continue in the same vein could be viewed as deception? To discuss flawed methodology and techniques would be a waste of time in my opinion. Particularly when being discussed by those who have a proven track record of being wrong. Wouldnt you agree femr2? Have you managed to use your methodology and techniques to establish that pre placed charges/explosive devices were detonated in any buildings on 911? If so, why havnt you done something about it? If not, why not? I know the answers femr2 but those you are trying to reach may not be aware of them. Last edited by Jackanory; 2nd September 2010 at 09:06 AM. No Abby, as you well know. You also know that your assertion is false. You clearly have nothing to add to this thread, other than to *address the arguer, not the argument* (which you have been recently warned about) - Rule 12. If you have any specific questions about the techniques in use, firstly, read the thread, then by all means ask questions. femr2, do you believe that United flight 175 struck the World Trade Center? Just curious. Having viewed your videos recently, I couldn't tell. If so, why did you put "Flight 175" in scare quotes sometimes? No matter how many times you are requested to stay on topic, you are incapable of doing so. Again, you mistake me for a no-planer. What relevance does it have to this thread ? Scare quotes ? LOL. Go and find something more interesting to spend your time on Carlitos. I'm not interested in what you are curious about, and if you wish to discuss something off thread topic, there are plenty of other places you can discuss them with me. Yet again, stay on topic please. Last edited by femr2; 2nd September 2010 at 09:54 AM. Last edited by femr2; 2nd September 2010 at 09:59 AM. The questions were not Rule 12 violations. They were about your methodology. You're just trying to dodge the questions. I think they're perfectly valid and appropriate, as you've used your technical methods to try to prove some pretty outlandish things in the past. Why can't you guys just get it from CBS directly? What's the point of using NIST as an intermediary? you've used your technical methods to try to prove some pretty outlandish things in the past. Incorrect. The application of tracing methods has been applied to elements of WTC 1 initiation, and *crush front* rate of progression, as has been made clear on this thread. What *outlandish things* are you suggesting tracing methods have been used to prove...? Who said anything about tracing methods, besides you? We're talking about the misapplication of your 'precise' methodologies to support outlandish claims in the past. About your use of technical jargon to make such claims seem more 'sciencey'. Sure, that's a bit OT to the thread, but it ain't no Rule 12 violation. Same for my question. I'm just trying to assess the judgement of the analyst looking at the data. Why can't truthers answer direct, simple questions? Here's my answer regarding United flight 175 impacting WTC2 - "yes." femr2's answer is ... ___________? About your use of technical jargon to make such claims seem more 'sciencey'. And there is an entire thread here that looks at the source of the question, namely the FlightExplorer information that places UAL175 50km NE of WTC 2 as 35000ft, and N175F at the location of the impact. My viewpoint is made clear on that subject, on that thread. Both are Flight 175. I assume you now see why suggesting that I think "Flight 175" did not exist is a false accusation. Last edited by femr2; 2nd September 2010 at 11:05 AM. I don't think Rule 12 means what you think it means. This is about the arguments and the methodologies used. There is no Rule 12 violation in discussing those topics. Thanks, but "yes" would have been a lot shorter. Too much time on your hands? I wonder what conclusion your youtube subscribers gleaned from a video asking "Which 'Flight 175' Crashed into WTC 2?" There were several "no plane" comments @ youtube. And your responses are interesting. No-planers are indeed no-brainers, but﻿ that's not what is being suggested. What is being suggested is that the aircraft which DID impact WTC2 was NOT UAL175. Another flight 175 (N175F) was shown on radar data. UAL175 is positioned miles NE of WTC2 at 31000 feet AFTER it is supposed to have crashed into WTC2. Or what they gleaned from analysis of "ejecta anomalies" from what you called "impact charges:"
To call﻿ the highlighted area an impact charge you would have to explain how it was detonated at the exact time the plane hit. I am not an explosives expert but I would bet that most experts would describe the highlighted plume as a point where the energy of the crash and explosion blew out a window. dreadnaught...Timing is a very minor issue. Many methods are fully﻿ possible with timing accuracy in milliseconds. 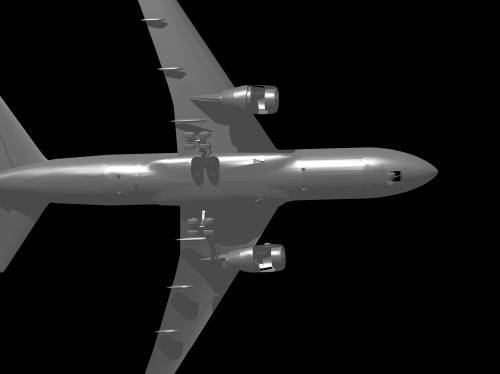 I see no point elaborating on that, as it's rather trivial, however, the video description will be updated to include details which explain WHY it is not an effect of the physical aircraft impact soon. So the ejecta from WTC was not a result of a jumbo jet hitting it at high speed? This is delusional, and veering into Ace Baker territory. As alienentity noted, you use video analysis and slick production to make vague accusations about 9/11. You find "anomalies" and present them as fact based on your analysis. You have no expertise in any area which qualifies your analysis to be taken at face value. You won't list any qualifications here. And you use technical jargon which at times you don't understand to make your work seem impressive. It's not. This is directly related to this thread. Also related to tfk's point within this specific thread, please note your claim of "milliseconds" above. You do not appear to understand the concept or application of error analysis when processing data. Far from enough I'm afraid. You find "anomalies" and present them as fact based on your analysis. Nope. I certainly highlight what I deem to be anomolies, and ask questions about them. Sometimes there are answers, sometime not. The near-central white plume ejecta from the impact video you have gone to lengths to dig into is possibly focussed ejecta through the central core corridor. The other highlighted area is still unexplained. You have no expertise in any area which qualifies your analysis to be taken at face value. You won't list any qualifications here. And you use technical jargon which at times you don't understand to make your work seem impressive. Incorrect. I may use terminology you personally don't understand, or interpret incorrectly. That's not my problem. This is directly related to this thread. No it's not. It's *attack the arguer* and ignore the *argument*. Look at the lengths you're going to...scanning through YouTube to quote mine for things you think make your *point*. Too funny. I'm a bit thicker skinned than that I'm afraid. It boils down to a simple and deliberate attempt to derail the thread. Oh. My. Many. Gods. Something actually about this thread...? please note your claim of "milliseconds" above. I assume you mean the NIST 5.4s graph. Note I state *using specific frame numbers*. The calc is fully qualified. You do not appear to understand the concept or application of error analysis when processing data. Incorrect. As also indicated, make of it what you will. Now, if you've finished wasting your time trawling YouTube (which you might note I haven't been to in months) get specific about the technical procedures pertinent to this thread, or be quiet Thanks mate. IThis is about the arguments and the methodologies used. Then I shall assume further comments will address sub-pixel tracing methods, their accuracy and direct arguments from such. This entire thread is laughable --why even bother with this frauds feeble uneducated attempts at video tracing? For Pete's sake, this stooge is using a program that isnt even an acceptable program to utilize for his intended and stated purpose. Look it up. he is using a inferior program with bad data and no understanding of the results he spews. Frankly, HE HASN'T A CLUE AS TO WHAT HE IS DOING. I understand (most of) your jargon just fine. My concern was, and is, that your pseudo-sciencey jargon, charts and graphs and pretty video production impresses truthers, who then use it to validate their erroneous theories. Like "no plane" (flight 175) or "bombs in the WTC tower" (ejecta anomalies). This is visible in the comments section for your videos, whatever the context of their presentation elsewhere may be. I only picked a random 2 or 3 that had something to do with flight 175, and no, I certainly won't be trolling for more. The preceding is true whether you consider yourself part of the "truth" movement or not. Similarly, your youtube channel subscribers and friends include lots of truther fantasists, including luminaries like "alexjones4president" and "WarCrime911." You can play naive all you like, but the fact remains that your vague and misleading insinuations are used to validate truther fantasies which have no grounding in fact. Like "bombs" or "fake planes" or "the government did 9/11." I suspect that this is why you refuse to state an alternative hypothesis which better explains the events of 9/11/2001; you don't have one, preferring to "just ask questions" just play with video. Heck, look at the comments on your own website to see this. Missiles? Pods? I won't comment further on this thread, per your request. If there is a purpose for your analysis other than questioning the common narrative of 9/11/2001, I'd be curious* to hear it. using a program that isnt even an acceptable program to utilize for his intended and stated purpose. SynthEyes is one of a small number of available *match mover* applications. There are not any applications designed to perform the task I'm using it for, however, the 2D tracking engine is of superb quality and accuracy. There are a couple of rather more expensive options out there, but I'm afraid I'm not prepared to invest the $10,000 required for a BOUJOU or 3DEqualiser seat, for what is basically an extremely similar underlying tracking engine. Accuracy has been shown to be at least on-par with the flawed NIST moire method, which claims inch accurate metrics. If you are aware of an application that you can show exceeds the 2D tracking engine capabilities of SynthEyes, then by all means say so. If not, then your comments are entirely without merit (as per usual). I won't comment further on this thread, per your request. I got the expected response. I asked specific questions relevant to the methodology and techniques used and how those same methods and techniques have been wrongly used by you to reach incorrect conclusions in all other areas of 911. A plethora of false and misleading information that leads directly to false conclusions or misleading assumptions as shown in works on youtube and posted here by alienentity. Did you submit those works to youtube? Have you accepted that the methods used have concluded in you being incorrect? Was the 'POD' a bomb? In my opinion it is deception to continue in the same vein knowing that those very methods and techniques have already lead to failed conclusions. This is not the accepted norm amongst those seeking advancement in their field of expertise. Are you making progress? Incorrect. Nothing to do with tracing techniques. and how those same methods and techniques have been wrongly used by you to reach incorrect conclusions in all other areas of 911. Again, incorrect. Provide example of incorrect conclusions derived from the methods and techniques being discussed in this thread (sub-pixel video feature movement tracing). Was the 'POD' a bomb? I'll assume you've *had your say* now Abby. Not one technical point raised whatsoever. Your opinion is about as much use as a chocolate teapot. Now, if everyone has gotten all their personal frustrations out of their systems, . He has no reality based goal, or purpose for his work; and if he could he would censor the those who can comment on his work; on-line, he has to block dissenting points of view. I thought reference and sources for his steps would be great; but they are not going to happen. If this was his forum, or his video, we would be blocked; he hates JREF and has said so. No sources, no reference, no goal, no purpose. The CD delusion runs deep in 911 truth; past reason. This work might be interesting but serves no purpose; there are proprietary and other classes of this work already done. Without modeling the errors due to lens, atmosphere, and many other errors, this work is a waste. I worked with engineers, professors, PhDs and scientist who did this type of work right; we are 10 pages away from just setting up the introduction. there are proprietary and other classes of this work already done. Without modeling the errors due to lens, atmosphere, and many other errors, this work is a waste. Incorrect. The main usage of trace data thus far has been determination of the relative start points of multiple building features. Quantifying the suggested errors is irrelevant in that context. Also, given the scale of other noise sources, such as video artefacts and quality, the effect of the suggested factors are of lower magnitude and are not separable. Lens distortion will present itself over large movement distances, atmospheric distortion (such as smoke) is minimised due to the use of region based tracing methods, and...well, that's all you've listed. I've been looking at other sources of noise, such as tracing algorithm noise, camera shake, ... There will be more time to look at other possible sources of noise if the substanceless noise in the thread is eliminated. You are not aware of other work? That is all I will say about that; I thought you were an expert on this stuff (not really, it is like you make it up as you go); I see you are unaware of other work. Good for you, you must think you are a pioneer in the field. No wonder you don't source or reference anything. Source and references please. Wait; did you say hand waving? You are making up these claims and you don't understand the errors. Your claims are not sourced, no references, and seem to be backed by only your opinion. But then you did say hand waving. Good for you. substance-less noise, yep, you hand wave away the errors and fail to quantify them. No goal, no purpose, no tie to 911, no sources, no reference, no backing up claims with the same - Substance-less work (no wonder you have to block u-tube users from making comments) Will there be/is there a you-tube video? Last edited by beachnut; 3rd September 2010 at 12:32 AM. You complain about sources, yet you are refusing to do so ? Interesting. No wonder you don't source or reference anything. I've pointed you at the most relevant source beachnut...NIST. By all means post references to others. For what ? For saying that lens distortion will only present itself over large movement distances (utterly obvious), and atmospheric distortion (such as smoke) is minimised due to the use of region based tracing methods (less obvious but correct nonetheless) ?